Here's another roundup of articles and essays that you might find interesting. Some serious, some frivolous. Because balance, Daniel-san. Always find balance. Vulture: "The Last Slave: In 1931, Zora Neale Hurston sought to publish the story of Cudjo Lewis, the final slave-ship survivor. Instead it languished in a vault. Until now." Atlas Obscura: "Stone Cats at Nike Missile Site"
If the threat of atomic annihilation wasn't terrifying enough in the early years of the Cold War, this 1951 Federal Civil Defense Administration pamphlet wanted to make it clear that you were hardly out of the woods if you and your nuclear family happened to survive the initial fury of human-engineered atom violence. Because after the Earth-rattling, house-leveling, radiation-showering atomic blast comes ... fire. And the FCDA, under the direction of Millard Fillmore Caldwell (1897-1984) — whose life spanned Sergei Rachmaninoff and Duran Duran — wanted civilians to be prepared to fight those fires. 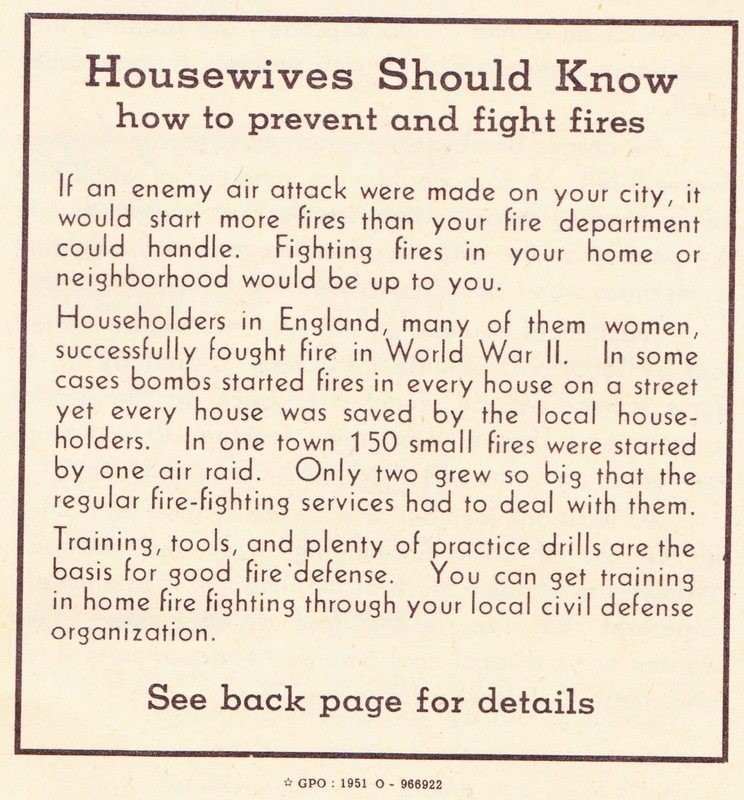 Closets, attics, and cellars are the main source of home fires, and plain ordinary good housekeeping is a strong line of defense against them. 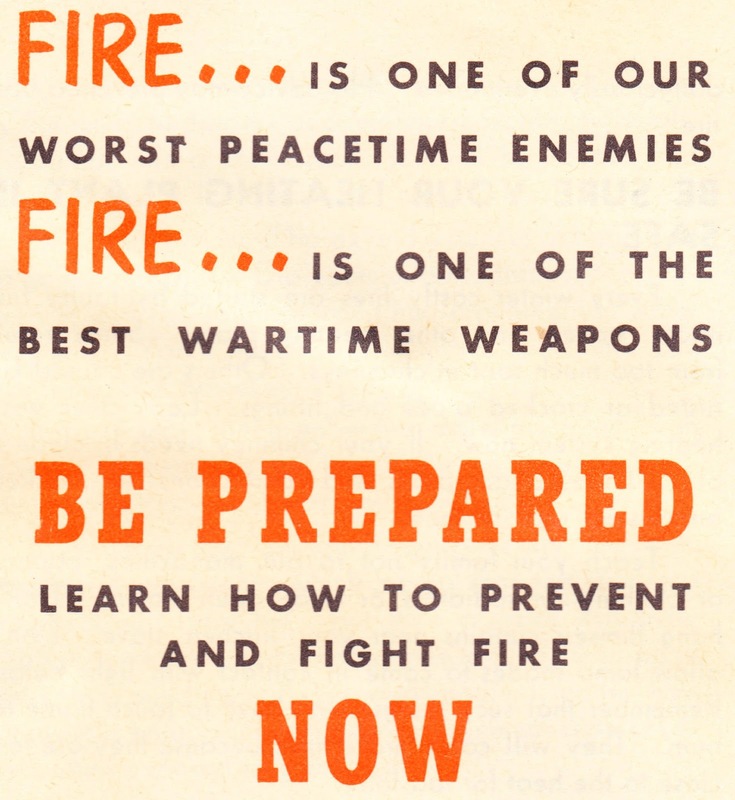 Fire hazards in peacetime become doubly dangerous in wartime. Check your closets, attic, and basement for cast-off articles that would burn. Clean out your storage places. You will be surprised at how many burnable odds and ends are really useless to you. Don't let them make your home a fire hazard. Get rid of them. Don't stop when you've cleared out the inside of your house. Go after rubbish in the your back yard, in alleys and in vacant lots near your home. Collect the rubbish and burn it. Don't leave it around to burn if an enemy bombs your city. You can buy fire-resistant drapery and furniture-covering materials. Or you can mix a fire-resistant solution for rayons and cotton yourself. It's cheap and easy to use. Dissolve 9 ounces of borax and 4 ounces of boric acid in a gallon of water. Dip your curtains, drapes, and slipcovers in it. This solution won't hurt anything that water won't hurt. You'll have to use it again each time you wash the fabric, however. After an atomic bomb explodes, the resulting fires could cause more loss of life and property than the blast itself. An atomic bomb would cause great fires in the area where it fell. It would also start hundreds of small fires in surrounding areas. These smaller fires must be fought by people on the spot, because the regular fire-fighting companies won't be able to reach them. Teaching of householders to fight fires will be carried out by local civil defense instructors. At least one member of your family must be trained in the use of basic fire-fighting tools and methods. Women are at home much of the time. It is particularly important that they know how to fight fires. 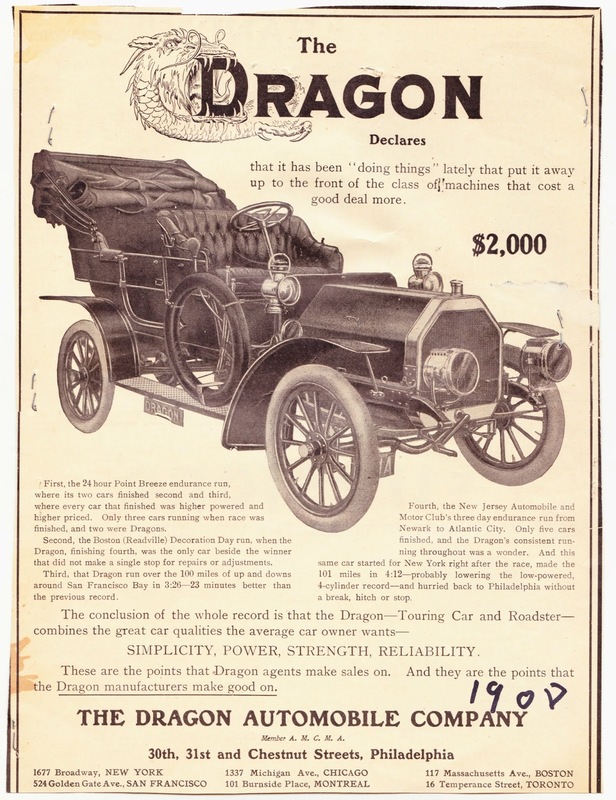 I gave Sarah this 1908 advertisement for Dragon Automobile Company as a gift for her high school graduation earlier this month, because it contains two things that she loves — cars and dragons. And, outside of perhaps Wacky Races, that's not a combination you see too often. The Dragon Automobile Company was short-lived, lasting only from 1906 to 1908, during which time it moved operations from Kittery, Maine, to Detroit to Philadelphia. Leo Melanowski, who had previously worked with the Otto Gas Engine Company (no relation), was the design engineer of the Dragon. The Dragon Declares that it was been "doing things" lately that put it away up to the front of the class of machines that cost a good deal more. First, the 24 hour Point Breeze endurance run, where its two cars finished second and third, where every car that finished was higher powered and higher priced. Only three cars running when race was finished, and two were Dragons. Second the Boston (Readville) Decoration Day run, when the Dragon, finishing fourth, was the only car beside the winner that did not make a single stop for repairs or adjustments. Third, that Dragon run over the 100 miles of up and downs around San Francisco Bay in 3:26 — 23 minutes better than the previous record. Fourth, the New Jersey Automobile and Motor Club's three day endurance run from Newark to Atlantic City. Only five cars finished, and the Dragon's consistent running throughout was a wonder. And this same car started for New York right after the race, made the 101 miles in 4:12 — probably lowering the low-powered, 4-cylinder record — and hurried back to Philadelphia without a break, hitch or stop. Read more about Dragon at American Automobiles and in Alan Naldrett's 2016 book Lost Car Companies of Detroit. It seems that many of the cars ended up being used as taxi cabs. I can't find evidence of whether any working or non-working models of the Dragon exist today. It was 25 years ago this month that I graduated from Penn State University, turned pro and began my journalism career at The Gettysburg Times. During my four years of college, I had worked on Penn State's student newspaper, The Daily Collegian. 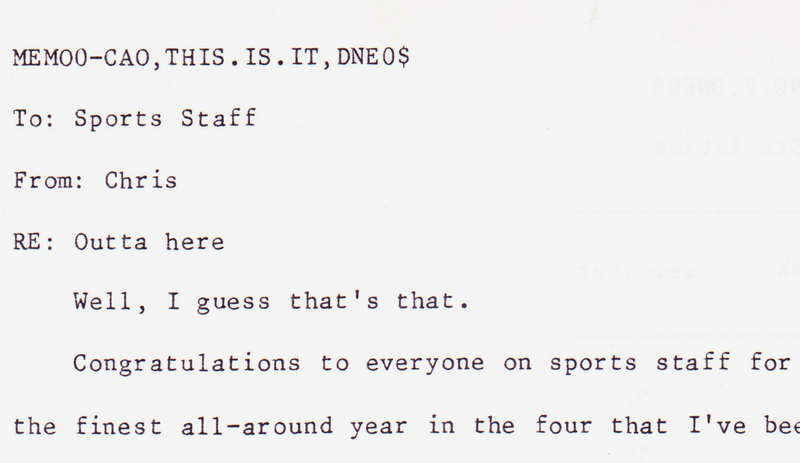 I was one of the editors on the sports staff during my final semester, and I recently came across a copy of the final memo that I wrote to the sportsters in May 1993. Well, I guess that's that. Congratulations to everyone on sports staff for what was certainly the finest all-around year in the four that I've been here. Y'all deserve a lot of credit for putting out what I can safely say is the best and most comprehensive college newspaper sports section in the country. Best of luck to all of you in your future endeavors, whether they be here at the Collegian or in some other field. For those of you staying on with Collegian, I'm confident you will make next year just as great as this one, if not better. -- Be aggressive and ask lots of questions, including WHY and WHAT DOES THIS MEAN TO THE AVERAGE READER. -- Talk to people, and do lots of interviews. Great interviews are the necessary starting point for great stories. Getting those perfect bits of information and anecdotes are half the battle. -- Don't confuse lots of interviews with lots of quotes. Stories don't have to be quote-heavy. In fact, the best ones aren't. YOU are the writer — let your narrative tell the story. -- Strive to make your leads great. A quality human-interest or anecdotal lead is almost always the start of a great story. Well, that's all. Keep in touch, if you can. I'll try my best to do the same. The reverse side of the 8½-by-11 sheet of paper this memo was printed on contains the final statistics for the Spring Semester 1993 — STATS-CAO, FOR.SPORTS.STAFF.NO.2, DNE0$. The 33 staff writers and candidates (first-semester reporters) on the sports staff had a total of 668 stories published in the Collegian that spring. 1. That's definitely a Harry Kalas reference. 2. My regular memos that semester — I'm not sure what the frequency was — including a "kudos" section for high-achieving sportswriters. 3. My second y'all of the memo. Memory plays tricks on you, because I didn't think that I started using that word regularly until my stint living in South Carolina from 1997 to 2000. 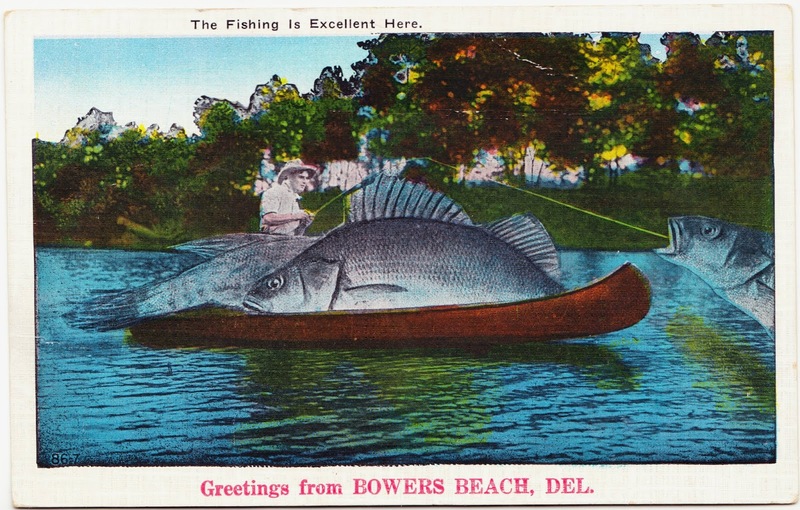 Here's a linen postcard from the family archives. It was mailed in March 1957 from my great-grandmother, Greta, to my mother, Mary. It traveled 1,000 miles (as the crow flies) from Miami, Florida, to the house on Oak Crest Lane in Wallingford, Pennsylvania. It has a red, two-cent Jefferson stamp and a PRAY FOR PEACE cancellation. Wrote Charles last night. Will not write you a letter until you write to me. Wish Grandaddy would write me, also. Love it here, too. [?] 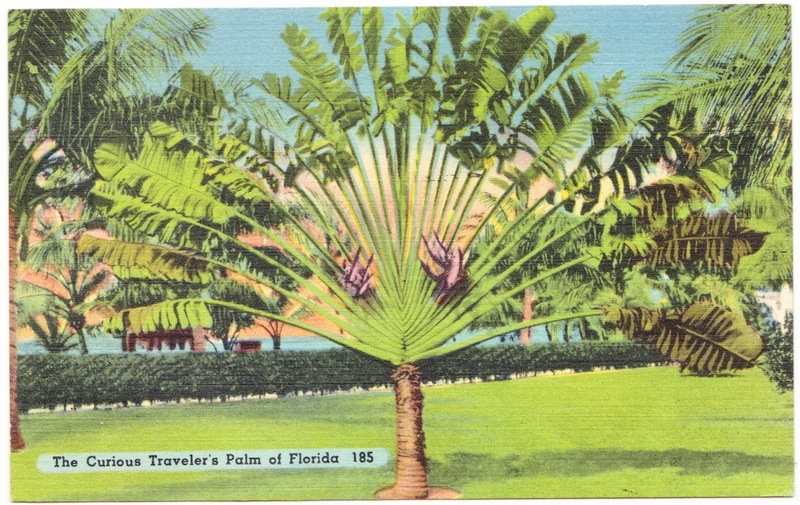 had a palm like this once. They are hard to grow — hold water in a cup for travellers to drink — reason for its name. I love to hear the birds sing & peep. Love, Grandmother. 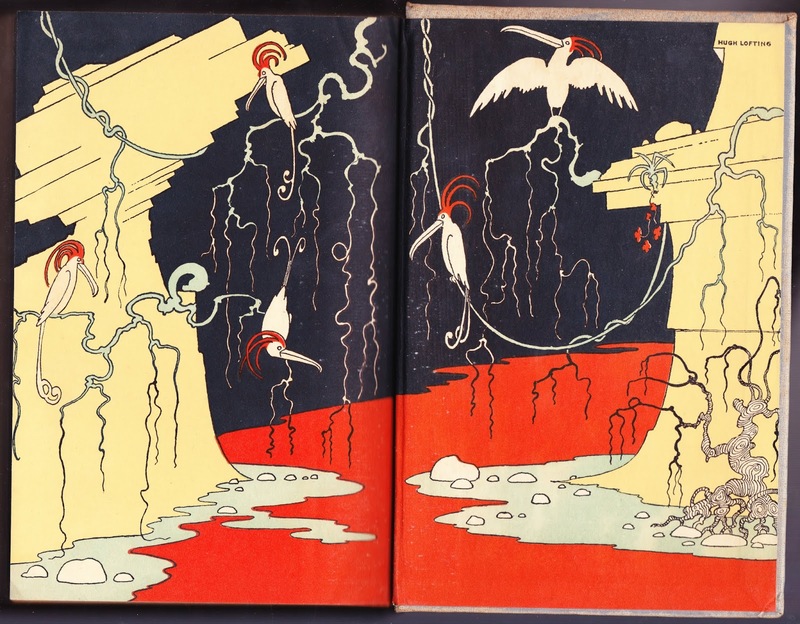 Book cover & endpapers: "Doctor Dolittle in the Moon"
Publication date of this edition: Difficult to determine. It is listed as the "Twelfth Impression." Many editions were issued, some with different exterior color palettes. Best guess is that this edition is circa the early 1950s. Provenance: (1) There's a label on the inside front cover indicating the book once belonged to Ann Cecilia Snyder, who lived in San Juan, Puerto Rico. (2) It was purchased by me this year in Gatchellville, Pennsylvania. Some chapter titles: "The Land of Colors and Perfumes," "The Singing Trees," "The Magellan of the Moon," "Monkey Memories of the Moon," and "How the Moon Folk Heard of Doctor Dolittle." First sentence: In writing the story of our adventures in the Moon I, Thomas Stubbins, secretary to John Dolittle, M.D. (and son of Jacob Stubbins, the cobbler of Puddleby-on-the-Marsh), find myself greatly puzzled. Last sentence: "Between them they will find a way." Random sentence from middle: It was curious that after that I too longer feared the enormous creature who looked like something from a fairy-tale or nightmare. 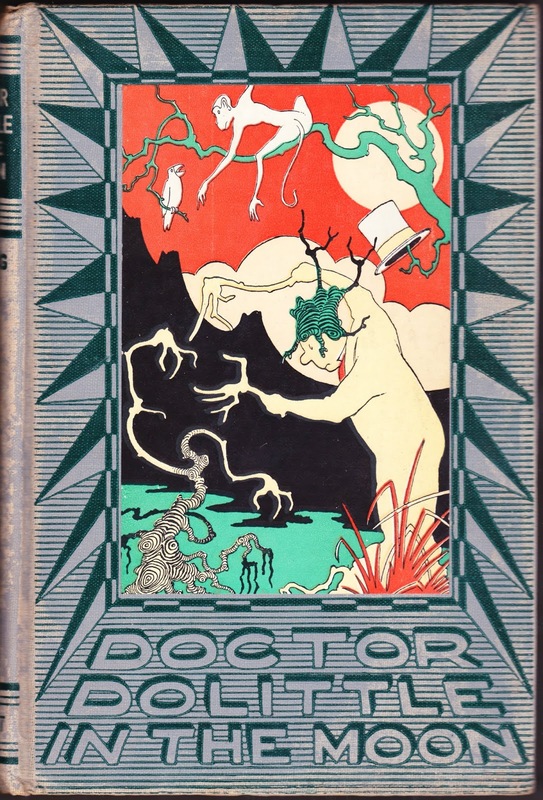 Wikipedia description of book: "Doctor Dolittle in the Moon (1928) was intended to be the last of Hugh Lofting's Doctor Dolittle books, and differs considerably in tone from its predecessors; the stripped down narrative does not have room for any of the sub-plots and tales previously present. Instead there is a growing sense of an event about to happen that is almost spooky in tone. There are some very complex passages for a children’s book; for example, it begins with a meditation about what the writer expects from the reader and vice versa." Goodreads review excerpt: In 2007, Jean wrote: "What I love it for, however, is Lofting's thoughtful imaginings of what life would be like on the moon, not only the phantasmagorically evolved giant trees and moths (good indoctrination in Darwinism, too), but also what it would feel like to walk in low gravity, how far you could go in a step, to what extent the curvature of a smaller sphere would be evident to one used to the earth's size. And I will put the passage from the book's lonely middle about the comfort of the formerly forbidding stars up against anything you care to bring." Amazon review excerpt: In 2010, Laserlad wrote: "I read Dr. Doolittle in the Moon as a child and recently was reminded of it when I saw a huge moth feeding on a datura flower under a full moon. It is a magical treat." Pennsylvania Dutch recipes from C.H. Musselman Co. 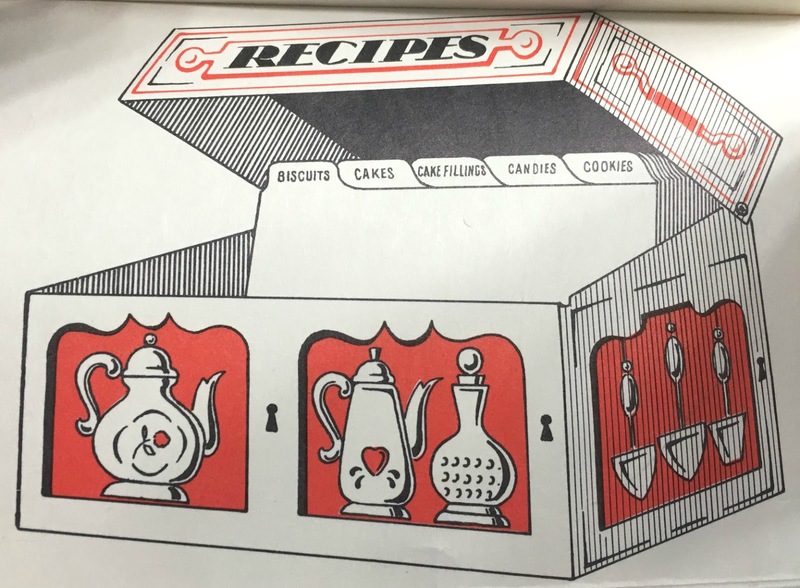 This is a cover of a postcard-sized, accordion-foldout recipe booklet published by The C.H. Musselman Company of Biglerville, Pennsylvania (about seven miles north of Gettysburg). Musselman's, located in the apple-orchard countryside of northern Adams County, is well-known for its apple-based products, including juices, applesauce and apple butter. According to its website, "Musselman’s was founded in Biglerville, PA, in 1907 by Christian and Emma Musselman. ... The Musselman family, devout Mennonites of Pennsylvania Dutch descent, was inspired by much more than producing good food. They felt a keen sense of community obligation and created the Musselman Foundation in 1942. Over the course of 70 years the foundation has continued to support the local communities by donating to local schools, colleges, libraries, and hospitals." That helps to explain the Pennsylvania Dutch tie-in on this branded recipe booklet. 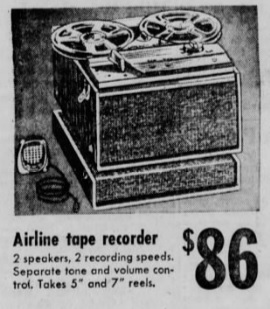 It probably dates to the 1960s. One clue: The front side of the booklet, which was intended for mailing out as a souvenir, calls for a four-cent stamp. Postcards could be mailed with four-cent stamps between January 1963 and January 1968, when the rates increased. 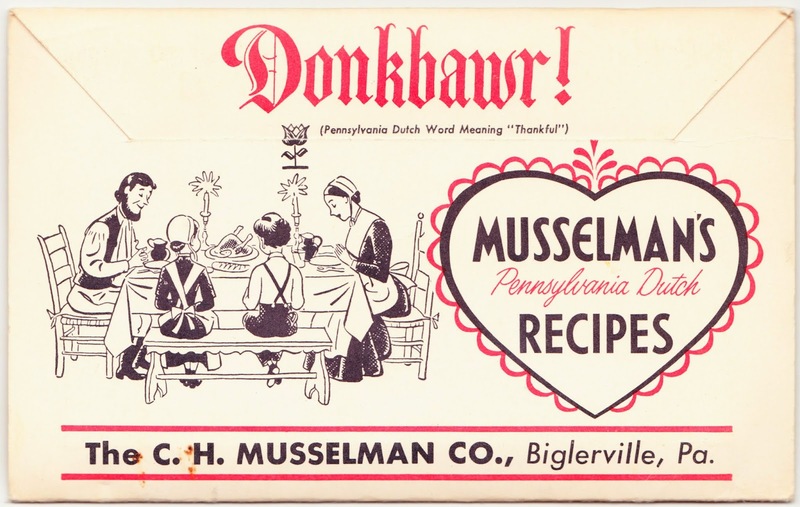 In addition to an illustration of a family sitting down for a meal, the cover of the booklet includes the word Donkbawr and adds that it translates to "Thankful" in Pennsylvania Dutch. Heat apple sauce to boiling, add lemon juice and simmer gently 10 to 15 minutes, or until sauce is very thick. Add the cherry gelatin powder and stir until dissolved. Remove from heat and stir in chopped walnuts. Pour into mold until set, unmold on nest of lettuce. 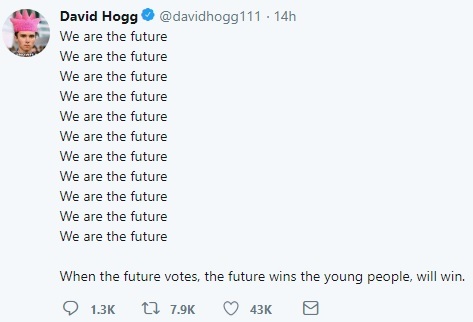 *That odd misspelling is correct. Here's a Flickr image of the label. Pour contents of 1 jar Musselman's Applpie into 1 quart casserole. Mix together oatmeal, flour and brown sugar. Cut in butter to make crumbs. Pour crumb mixture over apples and bake in 375° oven for 30 minutes. These traditional "Wonderful Good" Kitchen Tested Pennsylvania Dutch recipes are best contained in a Musselman Kitchen Recipe File, pictured below. It is a beautiful colored metal file which holds the Pennsylvania Dutch Recipes as well as file cards for your personal culinary secrets. As easy to get as these recipes are to follow: Send any two Musselman labels along with one dollar in cash, check or money order to: Pennsylvania Dutch Recipes, The C.H. Musselman Co., Biglerville, Pa. and your handy Kitchen File will be shipped immediately. Akron Restaurant: "Homespun Pleasures of Lancaster County"
Enjoy a couple "Best-Loved Pennsylvania Dutch Recipes"
Who wants sauerbraten, bacon muffins & tangle britches? Last Monday's post featured illustrations from 1924's Principles of Clothing Selection, a textbook written by Helen Goodrich Buttrick. Other than the fact that the book was well-received in its day, there's not much online about HGB. But I did find a few mentions of her in the Newspapers.com archives, as she was for many years a resident of Woodstock, New York. They're worth sharing and a bit illuminating with regard to the public arc of a person's life. In May 1949, she was a defendant in a civil case centered around possible negligence in a traffic collision, according to The Kingston (New York) Daily Freeman. In February 1955, the Daily Freeman reported that she was "committeewoman at large" of a group of Woodstock School District taxpayers who were unhappy with a proposed $65,000 addition to the local school. 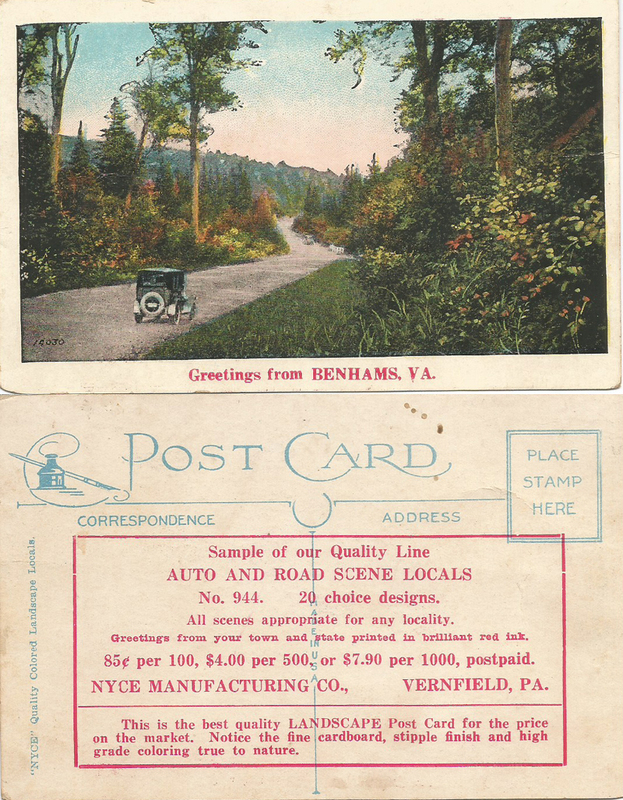 "Mrs. Helen Goodrich Buttrick, who had requested the board to place on the agenda a discussion on related problems of traffic and road conditions, touched off the debate with a suggestion that the town take advantage of the excellent fall weather to put the parking and traffic problems in order." "Fresh Baked Louisiana — Zombie — Applesauce" WHAT?? The equivalent of $741 today. 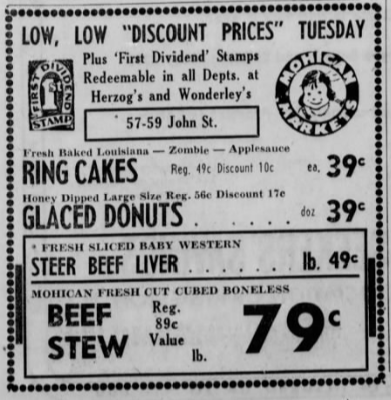 The next relevant article appears in the January 15, 1958, edition of the Daily Freeman, alongside an advertisement for Hamburger Paradise and its $1.00 weekend special. On Government CostsIn a letter in this column today, Mrs. Helen Goodrich Buttrick says, in part, that "it is only common sense for every citizen to scrutinize all expenditures by local government and to demand conscientious and economical administration on the part of every official..."
"Going over old tax records can be a very shocking experience — speaking literally. "Between 1923, when the writer began paying property taxes, to the present, rates on the same property have have increased about twelve times in amount. Part of this increase is due to greatly increased and more efficient services. We have better roads which are better maintained; our fire department has more and better equipment; the village of Woodstock has a public water supply. "But, on the other hand, the population of Woodstock has greatly increased, broadening the tax base, and proportionately lessening the individual taxpayer's share of the tax burden. "It would taken an expert tax accountant to plot the comparative curves of cost of living rise and tax rise, but every citizen realizes that taxes are high. So it is only common sense for every citizen to scrutinize all expenditures by local government, and to demand conscientious and economical administration on the part of every official. "We have the right to know how our tax money is spent, and to be given clear and complete answers to all our questions as to the expenditure of tax moneys .. HELEN BUTTRICK." In September 1961, the Daily Freeman reported that Helen Goodrich Buttrick had been named to the committee for the Woodstock Democratic Party. Finally, in November 1961, there is this excerpt from a Daily Freeman article headlined "Children Make Fine Showing in UNICEF Program." A total of $224.99 was collected by more than 250 children in the Woodstock school who took part in the annual Halloween "Trick or Treat" program for the Children's Fund of UNICEF. "Those of us who had happy children visit us on Halloween were deeply thankful that our children are safe and happy and able to share with other children, unknown to them, sick and hungry, who so badly need the pennies they collected. We dedicated ourselves anew to the grave tasks that lie ahead of making the world safe for all the children of the world. And we understood, as never before, the urgency of keeping strong the United Nations for the many great tasks before it that Peace may finally come to the world. "Children like to share in grownup responsibilities. And this project, particularly their own, gives them dignity and achievement, and equality with grownups, and helps them grow in stature to face later the problems they must face."